When most people think about surfing in the U.S., places like California, Hawaii, and even Florida come to mind. But there is another totally unexpected destination that provides some surprisingly great waves too. It's colloquially known as the "Third Coast" and its located right in America's heartland. The Great Lakes may not offer the same experience as some of those other popular destinations, but adventurous surfers will still discover 20+ foot waves and a complete lack of crowds. They'll also find very little in the way of marine life (read: no sharks!) and tides are pretty much nonexistent too. In short, surfing these bodies of water is unlike anything else around and it is highly rewarding in its own right. When surfing the Great Lakes, it is important to dress appropriately (that means a wetsuit or drysuit), have a proper board (thicker for freshwater surfing), and be prepared for unexpected conditions. The water can be rough and the high winds add to the challenge of staying on your board. With that in mind, here are our choices for the best spots to surfing on these amazing bodies of water. Wisconsin isn't exactly a place where you'd expect to find great surfing, but it was home to the Dairyland Surf Classic for years. The event was held for more than two decades on the western shores of Lake Michigan in the town of Sheboygan, where a dedicated surf culture has emerged over the years. The best surfing occurs there from August to April, which means pack a drysuit and be prepared for cold conditions throughout much of the season. The city offers five miles of surprisingly beautiful beach with a total of 22 breaks to ride. All of that falls within the city limits, making it easier than ever to grab a board and get out on the water. It doesn't take long out on the water to discover why Sheboygan has been dubbed "The Malibu of the Midwest." Located on Lake Michigan's southern shore, Whiting, Indiana is another great destination for surfers, provided they don't mind a little cold weather. The best time to hit the water in Whiting is during the winter and early spring, when powerful storms create high winds that are strong enough to generate impressively large waves. Thanks to its proximity to Chicago, Whiting is an easy town to reach. Hitting the water there is also a simple affair since access can be found within the city limits as well. An old refinery sits on the shoreline, dominating the landscape while surfers enjoy the large swells, which at times can rival those found in the more traditional surf towns in the U.S.
Michigan's Sleeping Bear Dunes National Lakeshore is a breathtakingly beautiful landscape that offers visitors a view of Lake Michigan from atop a 450-foot tall sand dune, while an island lighthouse gleams in the sun nearby. During the summer months, it is a popular destination for anyone visiting the area, but in the winter it also draws a dedicated group of hardy surfers too. In the colder months of the year, the Lakeshore is often pretty much deserted, bringing a sense of solace and serenity that is hard to find in most other surf destinations. The massive dunes make for a spectacular backdrop, as waves more than 20 feet in height create amazing swells to ride. If it weren't for the cold conditions, you might even forget that you're actually surfing on a lake rather than the Pacific or Atlantic Oceans. The residents of Duluth, Minnesota can attest to the excellent surfing found on the Great Lakes, as the city has about a dozen decent places to hit the water close by. The best of those is found at a place called Stony Point, where the deep water and unimpeded winds create the largest waves in the area. Beginners should head over to Park Point, where the beach helps to create a more friendly atmosphere for those just getting started. We're told that the mouth of the nearby Lester River makes for some solid point break surfing when the conditions are right as well. As with most of the other locations on this list, winter is the best time to go surfing in Duluth. With prevalent winds out of the north and northwest – plus higher-density cold air flowing in – larger waves are far more common during that time of year. 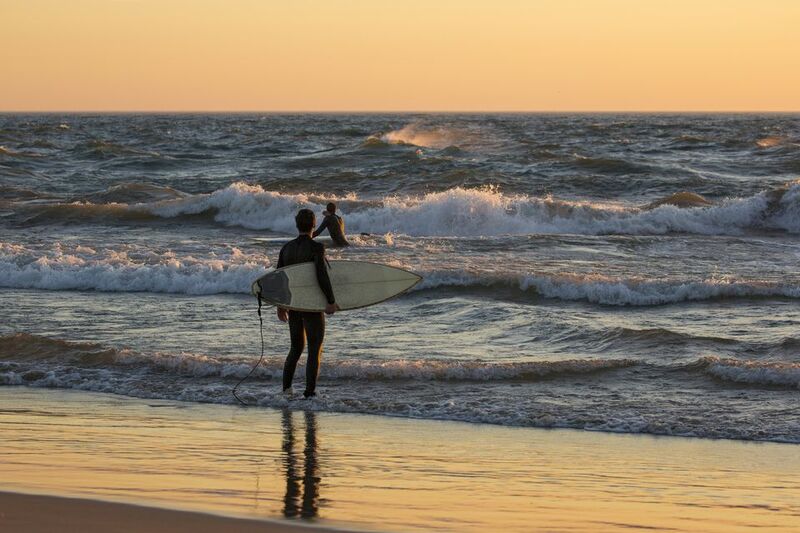 Pere Marquette Beach, located inside the city of Muskegon, Michigan, is another surf destination for Midwest thrill seekers to put on their list. The town normally sees strong winds across Lake Michigan in November, bringing some solid waves along with it. It is not uncommon to find 9-foot waves on the beach itself, even as larger swells are generated further out from shore. Nearby Muskegon State Park also offers good opportunities to catch a wave when conditions are right. For now, this destination remains largely off the radar, even with most Great Lakes surfers, and yet it also provides some excellent waves during the winter months. When surfing the Great Lakes it is important to dress appropriately (wetsuits or drysuits), have a proper board (thicker for freshwater surfing), and be prepared for unexpected conditions. The water can be rough and the high winds add to the challenge of staying on your board. Keep those things in mind and the high level of surfing that you find there just might surprise and delight.